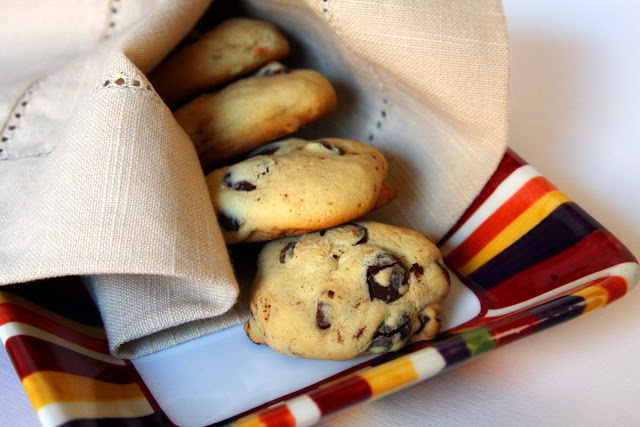 Who doesn’t love a good chocolate chip cookie? 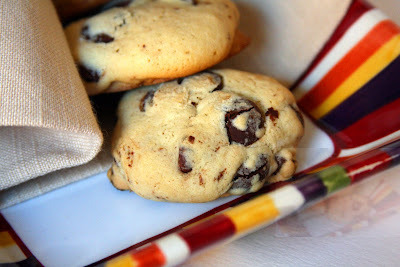 I have a recipe that I love love love, this one (pictures are awful; but cookies are awesome). And I’ve tried Alton Brown’s “The Chewy”, you can see and get my opinions here. But I have Martha Stewart’s Cookies book, that I’m pretty much obsessed with. That book, has FOUR chocolate chip cookie recipes. I figured it was about time I gave one of them a shot. I chose the one the book describes as Soft & Chewy. These were great cookies. They tasted delicious. They looked pretty. They were just… a little more cakey than The Boy & I prefer. I find this funny, because this book has a cakey chocolate chip cookie recipe, and it’s not this one! I’m not sure I’ll make these again. But that’s not to say this wasn’t a great cookie. As I said before, it was really yummy. But it was puffy! I don’t post recipes I don’t endorse, so don’t get me wrong, just because this wasn’t my favorite chocolate chip cookie, doesn’t mean I don’t think someone else will love it. So, if you’re looking for a pretty looking, and great tasting chocolate chip cookie, that’s puffy and cake-like, try this one! It’s called “Soft & Chewy”. This leads me to wonder, maybe I did something wrong when following the recipe. Please let me know if anyone else made this recipe, and got the same results. **Bake until cookies are golden around the edges, but still soft in the center, 8 to 10 minutes. Remove from oven, and let cool on baking sheet 1 to 2 minutes. Transfer to a wire rack, and let cool completely. 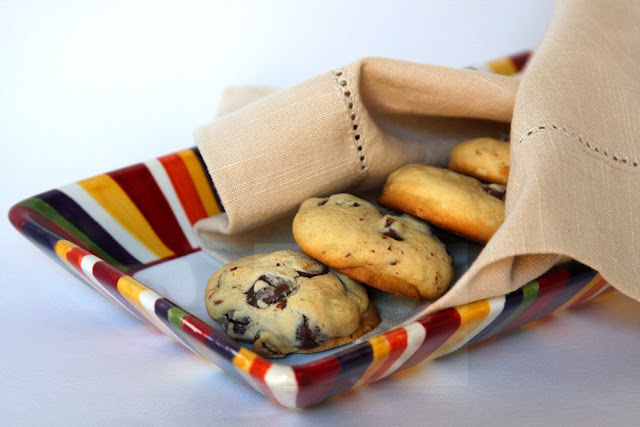 Store cookies in an airtight container at room temperature up to 1 week. Another fun part about making these cookies, is it was the first thing I’ve baked using the Mexican vanilla my friend Liesl got me, way back when she went on a Mexican Riveria cruise! I think when she gave it to me, I had just opened a new large bottle of vanilla. So, YAY for foodie friends!!! Thanks again Liesl! I love Martha's cookie cookbook. My favorite are definitely this one. Chewy chocolaty cookies. Mmm nice picture, as well! I made these too, and got the same result lol. So it's not just you. Unless we both messed it up. 😛 But they are O.K. for CCC. Awesome pics by the way. I'm always eyeing the Martha Stewart Cookies and the Cupcakes books. I'm going to check out this recipe the next time I go to the bookstore. I haven't decided if I like soft, chewy, crunchy, or cakey chocolate chip cookies yet. Maybe I should try this recipe and find out! I purposefully look for recipes that make soft cake like CCC's like these. But everytime mine come out flat as a pancake. This one too. I've tried everything. new soda, different flour, not baking them while raining outside, you name it. I've even added gluten to the flour hoping for a higher rising more cake like cookie. Conversely, I can take the same dough, spread it in the cookie sheet (has sides) and bake it like a pan or bar cookie and get the cake like cookie I want. With the same dough. So frustrating. Any hints? I'd like mine to come out like yours. This is my favourite CCC recipe and I get rave reviews for them all the time! But mine don't come out puffy at all… I wonder why? Misty – Do you refrigerate your dough? I always refrigerate a minimum of 24 hours. I just press plastic wrap into the dough, and put it in the fridge. And also, it could the TYPE of flour. I used White Lily, which I think maybe you can only get in the South. It has a lower protein content than most other all-purpose flours, and is similar to a cake or pasty flour. On the other end of the spectrum, King Arthur's flour has a high protein content. Perhaps you could experiment using different types of flours. From cake flour to white lily, to king arthur to bread flour. Good luck! And let me know if any of this helps!